In space, nobody can hear you scream. But that's not the case in movie theaters. When Alien first hit the big screen, it's blend of science fiction and horror made it a sensation. However, an R-rated film seems like a strange choice for a set of trading cards from back then. 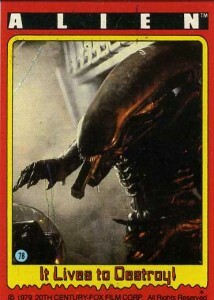 But that didn't stop 1979 Topps Alien from becoming a reality. The simple set mixes cards and stickers, similar to nearly every Topps entertainment release of the 1970s and 80s. It's not the easiest set to complete today, particularly the stickers. The 1979 Topps Alien base set has 84 cards. Images are mainly stills from the film, although the ship's crew are highlighted with the occasional promo portrait. A lot of the photos focus on exterior shots of the various spaceships from the movie. The interior images are often cluttered and hard to tell what's going on. This is a byproduct of the claustrophobic feel of the film. Card fronts have red outer borders. A small, yellow inner border also provides a spot for the card's caption. There's a torn or dripping effect below the caption, no doubt to evoke a creepier feel. Card backs are either a writeup about the film or a puzzle piece. 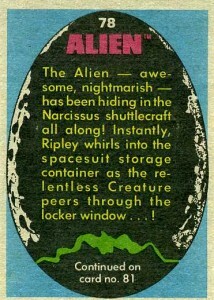 Writeup cards have the text written inside of the iconic egg from the film. The set has two different puzzles. Pink border pieces form the refinery while blue border pieces make the mummified alien. Stickers are typical of the day. A textured-looking green background gives way to a thick yellow border that goes around the die-cut sticker image. Images are reused from the base set. 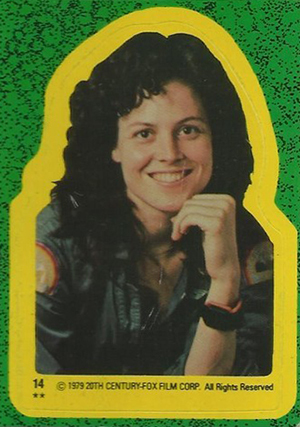 1979 Topps Alien packs come with ten cards and one sticker (and a stick of gum). The original price was 20 cents. Today, base sets are not too hard to find. Stickers are a little tougher but they're by no means scarce. 52 "Don't Touch it, Kane!" 60 The Thing Within Kane! 72 "Where Can it Be?" 78 It Lives to Destroy! 22 stickers. Inserted one per pack. 16 Where Can It Be? Vintage 1979 Topps ALIEN stickers - set of 7 - Great Condition. Some of the cards have a single star in the corner, others have two. I’ve seen a few of the cards that come in both versions. Any idea what that’s all about? 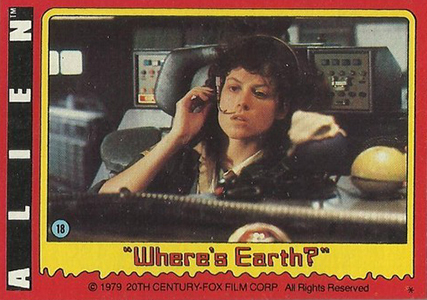 Did they short-print any cards in the 1979 Alien set? Im taking a guess about the stars: one star might mean first printing. two stars might mean second printing. I have 35 unopened packs of the Aliens movie trading cards from 1979 I was trying to sell for about 80.00.Do you think that’s a fair price.